Sumatriptan is a medication used for the treatment of migraine headaches. It is a synthetic drug belonging to the triptan class. Structurally, it is an analog of the naturally occurring neuro-active alkaloids dimethyltryptamine (DMT), bufotenine, and 5-methoxy-dimethyltryptamine, with an N-methyl sulfonamidomethyl- group at position C-5 on the indole ring. Sumatriptan is produced and marketed by various drug manufacturers with many different trade names such as Imitrex, Imigran, and Treximet as a combination product with naproxen. Sumatriptan is effective for ending the headache of a migraine. It is most effective when injected under the skin and when taken early after the start of the pain. Sumatriptan is structurally similar to serotonin (5HT), and is a 5-HT receptor (types 5-HT1D and 5-HT1B) agonist. The specific receptor subtypes it activates are present on the cranial arteries and veins. Acting as an agonist at these receptors, sumatriptan reduces the vascular inflammation associated with migraines. Sumatriptan is administered in several forms: tablets, subcutaneous injection, and nasal spray. Oral administration (as succinate) suffers from poor bioavailability, partly due to presystemic metabolism—some of it gets broken down in the stomach and bloodstream before it reaches the target arteries. A new rapid-release tablet formulation has the same bioavailability, but the maximum concentration is achieved on average 10–15 minutes earlier. When injected, sumatriptan is faster-acting (usually within 10 minutes), but the effect lasts for a shorter time. Sumatriptan is metabolised primarily by monoamine oxidase A into an indole acetic acid analogue, part of which is further conjugated with glucuronic acid. These metabolites are excreted in the urine and bile. Only about 3% of the active drug may be recovered unchanged. There is no simple, direct relationship between sumatriptan concentration (pharmacokinetics) per se in the blood and its anti-migraine effect (pharmacodynamics). This paradox has, to some extent, been resolved by comparing the rates of absorption of the various sumatriptan formulations, rather than the absolute amounts of drug that they deliver. Sumatriptan was the first clinically available triptan (in 1991). In the United States, it is available only by medical prescription. However, it can be bought over the counter in the UK and Sweden. Several dosage forms for sumatriptan have been approved, including tablets, solution for injection, and nasal inhalers. On April 15, 2008, the US FDA approved Treximet, a combination of sumatriptan and naproxen, an NSAID. This combination has shown a benefit over either medicine used separately. 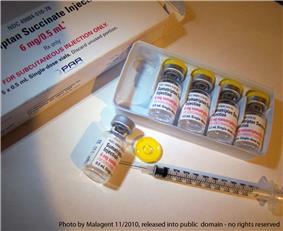 In July 2009, the US FDA approved a single-use jet injector formulation of sumatriptan. The device delivers a subcutaneous injection of 6 mg sumatriptan, without the use of a needle. Autoinjectors with needles have been previously available in Europe and North America for several years. Phase III studies with a iontophoretic transdermal patch (Zelrix/Zecuity) started in July 2008. This patch uses low voltage controlled by a pre-programmed microchip to deliver a single dose of sumatriptan through the skin within 30 minutes. Zecuity was approved by the US FDA in January 2013. On November 6, 2008, Par Pharmaceutical announced that it would begin shipping generic versions of sumatriptan injection (sumatriptan succinate injection) 4 mg and 6 mg starter kits and 4 mg and 6 mg pre-filled syringe cartridges to the trade immediately. In addition, Par anticipates launching the 6 mg vials early in 2009. Mylan Laboratories Inc., Ranbaxy Laboratories, Sandoz (a subsidiary of Novartis), Dr. Reddy's Laboratories and other companies have received FDA approval for generic versions of Imitrex tablets in 25-, 50-, and 100-milligram doses since 2009. The drug is available in U.S. and European markets, since Glaxo's patent protections have expired in those jurisdictions. However, sales of a generic delivered via nasal spray are still restricted in the United States. See also Sumavel DosePro (above). ^ a b c Derry, CJ; Derry, S; Moore, RA (28 May 2014). "Sumatriptan (all routes of administration) for acute migraine attacks in adults - overview of Cochrane reviews.". The Cochrane database of systematic reviews 5: CD009108. ^ The presence of the sulfonamide group in the molecule does not make sumatriptan a "sulfa drug". ^ "Patient bleeds dark green blood". BBC News. 8 June 2007. Retrieved 6 March 2010. ^ Kelly KM (June 1995). "Cardiac arrest following use of sumatriptan.". MEDLINE. ^ Razzaque Z, Heald MA, Pickard JD, et al. (1999). "Vasoconstriction in human isolated middle meningeal arteries: determining the contribution of 5-HT1B- and 5-HT1F-receptor activation". Br J Clin Pharmacol 47 (1): 75–82. ^ Fox, A. W. (2004). "Onset of effect of 5-HT1B/1D agonists: a model with pharmacokinetic validation". Headache 44 (2): 142–147. ^ Freidank-Mueschenborn, E.; Fox, A. (2005). "Resolution of concentration-response differences in onset of effect between subcutaneous and oral sumatriptan". Headache 45 (6): 632–637. ^ "Press release: First Over The Counter (OTC) migraine pill made available". Medicines and Healthcare Products Regulatory Agency. Archived from the original on 2014-12-05. Retrieved January 28, 2015. ^ Brandes JL, Kudrow D, Stark SR, et al. (April 2007). "Sumatriptan-naproxen for acute treatment of migraine: a randomized trial". JAMA 297 (13): 1443–54. ^ a b Brandes, J.; Cady, R.; Freitag, F.; Smith, T.; Chandler, P.; Fox, A.; Linn, L.; Farr, S. (2009). "Needle-free subcutaneous sumatriptan (Sumavel DosePro): bioequivalence and ease of use.". Headache 49 (10): 1435–1444. ^ Pierce, M; Marbury, T; O'Neill, C; Siegel, S; Du, W; Sebree, T (2009). "Zelrix: a novel transdermal formulation of sumatriptan". Headache 49 (6): 817–25. ^ "PAR PHARMACEUTICAL BEGINS SHIPMENT OF SUMATRIPTAN INJECTION". Par Pharmaceutical. 2008-11-06. Retrieved 2008-11-25.